The following general terms and conditions apply to all customers placing an order. By submitting an order to us through our website; using the order form on our website and confirming your order by clicking on the button ‘Confirm order’ (provided to this effect), you fully accept the following general terms and conditions which become effective upon confirmation of your order. The parties agree that this contract is subject to French law. Our mailing address (flagship boutique): 17 Rue des Puits Clos, 31000, TOULOUSE, France. Product descriptions for products listed at any given time on this website are not considered to be legally permanent proposals. Concerned products include confectionery and chocolate goods. The composition of these products is comprehensively listed on the page related to each item. The images shown with product descriptions are not contractual. We are unable to guarantee that the product images you see are an accurate representation of the actual merchandise. All items are subject to availability. Certain products are available during defined time frames only; these periods are specified in the product description. No order weighing over 25 kg may be placed. For orders exceeding this weight, please contact us by telephone on 05 61 12 34 75 or by email (contact@compagnie-chocolat.com) in order to discuss the specific conditions of your order. Once an item has sold out, the seller reserves the right to substitute with a product identical in size and in quality. All final prices shown on the order confirmation on www.compagnie-chocolat.com are definitive. This price includes the price of the product, handling costs, packaging and delivery, as well as all export taxes for countries outside of France (within the EU). No further customs duty or VAT will be charged for delivery within the EU. You are responsible for providing www.compagnie-chocolat.com with an accurate address for delivery during working hours. You are responsible for the payment of the total value of your order placed on www.compagnie-chocolat.com (total cost of product(s) and delivery charges), as well as for the payment (or where necessary the organisation of payment, whether to a forwarding agent or carrier), of customs duty, VAT or other taxes subject to import duties for product delivery to the delivery country. Shortly after you have placed an order with us and once we have received your payment, your order will be accepted by www.compagnie-chocolat.com and you will receive order confirmation by email. You will receive confirmation (or refusal where necessary) of your order within 24 business hours of our receiving it. www.compagnie-chocolat.com reserves the right to turn down any order and therefore refuse payment at any time, in particular for reasons of stock insufficiency, due to incomplete customer information, or for any other potential problem concerning delivery. In accordance with article L 121-20 of the Code of Consumption (French Republic), you are entitled to a 7-day period of withdrawal (starting from the delivery date), to return the products with which you are dissatisfied. However, in accordance with article L 121-20 3° of the Code of Consumption (French Republic) this period of withdrawal may not be applied for perishable products which cannot be returned or which are liable to become rapidly damaged or expire, such as chocolate. This right of withdrawal is free of charge for customers, except for the delivery cost of returning products. Products must be returned intact and in their original packaging. Returned items which are incomplete, damaged or dirty will not be accepted. All purchases are subject to immediate payment by debit/credit card. We also accept payment by cheque, but cannot deliver orders until we have received and cashed your payment for the order. Orders are delivered promptly, either directly to the recipient or, where the recipient is absent, by leaving a card to advise of a missed delivery. Delivery times are shown according to stock availability and the delivery option chosen. Where the recipient is absent, a card to advise of a missed delivery is left. ‘La Compagnie du Chocolat’ asks that you collect your parcel no later than 1 day after receiving the card notifying you of a missed delivery. Furthermore, ‘La Compagnie du Chocolat’ cannot guarantee the storage conditions of the postal service concerned. Potential delays in delivery do not entitle you to compensation and do not lead to reductions or to the cancellation of your order. In the unlikely event that the delivered product is incorrect or damaged, a claim must be made by recorded delivery to the carrier, within 2 days of the date of delivery. You consent to the use of your personal information provided during your order, for use in our customer database. In accordance with French Information and Liberty Law 78-17 dated 6 January 1978, you have the right of access and the right to rectify the information you have provided on our website. You are solely responsible for your choice of products, for their conservation after receipt, and for their use. Similarly, ‘La Compagnie des Confitures Ltd’ cannot be held responsible for legislative or regulatory rules applicable in the country of delivery, ‘LA COMPAGNIE-CHOCOLAT.COM’ being responsible for French regulations related to our products only. Cases of litigation fall within the authority of the jurisdiction of Toulouse. Only the Commercial Court of Toulouse has authority in cases of litigation. The following general terms and conditions serve to inform potential customers, whether individuals or corporate bodies, of the terms and conditions applied by ‘La Compagnie du Chocolat’ for the sale and delivery of ordered products. These general terms and conditions also define the rights and obligations of each party in the context of sales between the seller and the customer. By placing an order on this website you confirm your acceptance of these conditions. 1.1. All of our product prices are shown in Euros and are inclusive of VAT, subject to changes in the French VAT rate. Prices shown do not include delivery rates; these are added to the product price and are shown with the order total. 1.2. All purchases are calculated in Euros. 1.3. ‘La Compagnie du Chocolat’ reserves the right to change their prices at any time. However, product prices shown at the time of ordering will be used to calculate the order total, subject to availability at this time. Customers will be notified of any modifications before all orders are validated. 1.4. The VAT rate on the day the order is placed (shown on your order confirmation) is applicable. 1.5. Whatever country the customer orders from, the applicable VAT rate is that of the seller, i.e. a rate of 5.5% or 19.6% depending on the product. 1.6. For delivery outside of the EU: customs duties and the pertaining formalities are the sole responsibility of the customer. Products purchased on www.compagnie-chocolat.com remain the property of ‘La Compagnie du Chocolat’ until the outstanding amount has been paid in full. Orders placed on www.compagnie-chocolat.com go through several steps, at each step customers are required to click and validate. The final validation of your order is equivalent to accepting the information outlined in these general terms and conditions. Customers must be informed of the main features of the product by the seller, before concluding the sale. This being the case, you must declare that you understand and accept the present general terms and conditions before concluding your order. When you validate an order, you agree to the present general terms and conditions. Their application may not be questioned, except during the 7-day period of withdrawal starting on receipt of an order. In accordance with article 1369-2 of the Civil Code, ‘La Compagnie du Chocolat’ is responsible for confirming customer orders by sending an order conformation within 24 hours by email. This email acknowledges the exact details of your order, its cost, your method of payment and details of the delivery option you selected. Unless proved otherwise, the information saved on the site www.compagnie-chocolat.com (which is subsequently archived by us), constitutes evidence of all transactions carried out between ‘La Compagnie du Chocolat’ and its customers. 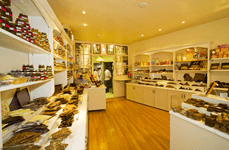 As detailed in article 1369-1 of the Civil Code, product offers and prices shown on the website www.compagnie-chocolat.com are valid for as long as they are published on the website, and are subject to availability. In cases where a product is no longer available after an order has been placed, you will be notified as quickly as possible by either email or regular mail. Products bought on the website www.compagnie-chocolat.com are dispatched according to the delivery methods defined in the paragraph entitled “Delivery Charges”, further to payment validation. Products are delivered to the delivery address you provide during the ordering process. In case of a delay in delivery, you will receive an email from us. Other than in case of force majeure or during the closing periods of the online shop (which are clearly announced on the website home page), delivery times (subject to availability) are shown below. Delivery times are counted from the day an order is placed (shown on the order confirmation sent to you by email). Products are only delivered once receipt of payment is confirmed by the seller’s banking organisation. For orders received before 1 pm. 2 business days after registration of your order, for delivery to Metropolitan France. Indicative delivery time in business days, subject to the timely drop-off of the parcel. 3 to 8 business days after registration of your order, for delivery to EU countries. Indicative delivery time in business days, subject to the timely drop-off of the parcel. The seller can in no way be held responsible for late delivery, whatever the cause. Therefore, no compensation of any kind may be demanded by customers. We do not deliver to hotels or PO boxes. Products are delivered to the address on the order form provided by customers; you are therefore responsible for every aspect of the name and address of the recipient, which must be accurate. If the delivery is returned, or is impossible due to missing information or an error in the address, all redelivery costs will be charged to you. Upon request, an invoice can be sent to your billing address instead of to the delivery address. Where the recipient is absent, the delivery person will leave a card to advise of a missed delivery, which will enable the recipient to collect the parcel at a place and time shown on the card. ‘La Compagnie du Chocolat’ asks that you collect your parcel no later than 1 day after receiving the card notifying you of a missed delivery. Furthermore, ‘La Compagnie du Chocolat’ cannot guarantee the storage conditions offered by the postal services concerned. If, on receipt of your parcel, the original packaging is damaged, torn or open, please inspect the condition of the contents. If they are damaged, you must refuse the parcel and make a note of the reason on the delivery docket (e.g. ‘Package refused as open or damaged’). Please record (in handwriting) any irregularity regarding the delivery on the delivery docket (damage, missing product with respect to the delivery docket, damaged parcel, broken or spoiled products, etc.) accompanied by your signature. This check is considered to be complete as soon as the recipient or another person, authorised by the recipient to take delivery, signs the delivery docket. The recipient must then send a recorded delivery letter to the carrier, detailing these remarks no later than 2 business days after receiving the item(s) in question, and transfer a copy of this letter by fax or postal service to the seller at the address shown in the legal terms and conditions of this website. If the product(s) need to be sent back to the seller, a request for a return must be made to the seller within 7 days of delivery. Claims received after longer delays will not be accepted. Returns for products will only be accepted if the products are in their original condition (packaging). Customers must inform the seller of any incorrect delivery and/or irregularity in the products or their quality with respect to the order form, either on the day of delivery or on the next business day after delivery. Claims received after longer delays will be refused. Any claim not made according to the rules defined above and/or received outside of the given time-frame will be refused and will clear the seller of all responsibility towards the claimant. Upon receipt of a claim, the seller will assign an exchange number to the product(s) concerned and will send it to you by email. A product exchange may only take place after an exchange number has been assigned. In case of incorrect delivery or exchange, any product to be exchanged or reimbursed should be returned to the seller in its entirety and in its original packaging by COLISSIMO, to the following address: 17 Rue des Puits Clos, 31000, TOULOUSE. The cost of this return is the responsibility of the seller. We accept payment by various methods, notably by online debit/credit card payments: Visa, MasterCard, and other debit/credit cards. The value of your order must be settled in one single payment. Payments received may at no time be considered as down-payments or advances. The total value of the order must be paid when validating the order. Refunds for scenarios covered by article 5 will be given within 30 days of receiving the products returned to us. Refunds may be given either by reaccrediting your bank account or by cheque, made out to the person having placed the order and living at the billing address. No cash on delivery is accepted. In accordance with article L 121-20 of the Code of Consumption (French Republic), you are entitled to a 7-day period of withdrawal (starting from the delivery date), to return or exchange the products with which you are dissatisfied. If the seventh day falls on a Saturday, Sunday, bank holiday or non-working day, this is extended to the next business day. However, in accordance with article L 121-20 3° of the Code of Consumption (French Republic), this period of withdrawal may not be applied for perishable products which cannot be returned or which are liable to become rapidly damaged or expire, such as chocolate. This right of withdrawal is free of charge for customers, except for the delivery cost of returning products. Products must be returned complete, intact, in their original packaging and in perfect condition for resale. Returned items which are incomplete, damaged or dirty will not be accepted. In accordance with the Chatel law of 1st June 2008, refunds resulting from revocation during the withdrawal period are principally given by payment method, and concern the full value of amounts paid; delivery charges (for the dispatch and return of products refused by customers) are therefore included. Refunds are given as soon as possible, within 30 days of revocation. Returns should be sent to ‘La Compagnie du Chocolat’: please contact us by email in order to discuss the procedure to be followed. This right of return can only be accepted for products in their original packaging, complete, in good condition and accompanied by proof of purchase. Items which are returned incomplete, damaged or spoiled by the customer will not be accepted for a return. 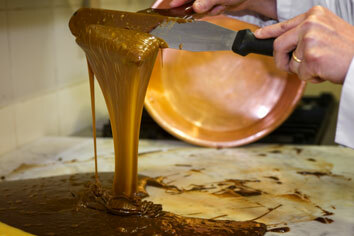 Returns should be addressed to ‘La Compagnie du Chocolat’ – Customer Returns - 17 Rue des Puits Clos, 31000, Toulouse. In cases of irregular or offensive returns ‘La Compagnie du Chocolat’ reserves the right to refuse subsequent orders. For payment by credit/debit card, our website uses a secure payment system developed by our bank: this platform and its name are shown when an order is placed. In accordance with the regulations of the Code of Intellectual Property, only private use of the Code of Intellectual Property is authorised, subject to different and potentially more restrictive regulations. Any reproduction, whether full or partial, of the website www.compagnie-chocolat.com is strictly prohibited. ‘La Compagnie du Chocolat’ will not pass on your personal details to a third party. We consider this information to be of a highly confidential nature. The information you provide will be used only to handle your order and to complement and personalise your product as well as our communications with you; mainly by sending you news updates published on our website www.compagnie-chocolat.com, and also by personalising our website in order to best cater for your tastes. You have the right of access to the information you have provided on our website, as well the right to modify and refuse the use of your personal information. In order to do so, please send a written request (by either regular mail or email) with your surname, first name, address and if possible, your customer reference number. The products proposed on our website are compliant with French legislation in force, as well as with the regulations applicable in France. Our company ‘La Compagnie du Chocolat’ is not liable where the legislation of the country to which the product is delivered (for example in cases where a product is banned, etc.) is not respected. It is your responsibility to check regulations for importing or for the use of products or services with your local authorities before ordering. The images and text shown and illustrating our products are not contractual. ‘La Compagnie du Chocolat’ may not be held responsible for the non-performance of a contract, in cases of force majeure, stock shortage, disruption or all-out and partial strikes (particularly of postal services and transport systems and/or communications), flooding and fire. In the case of corporate purchases and according to these terms and conditions, our company can in no way be considered liable for any indirect damages, operating loss, loss in profit, loss in opportunity, damages or expenses, which may result from the purchase of our products. ‘La Compagnie du Chocolat’ cannot be held responsible for any indirect damages which result from the purchase of our products. The seller cannot be held responsible for cases where the recipient is absent for delivery of our products and/or in cases where customers (or a person chosen by them) do not collect their parcel, or collect their parcel outside of the recommended time-frame from the carrier, after a card has been left advising them of a missed delivery. Information concerning internet fraud: phishing is a type of internet fraud, aimed at tricking internet users by producing perfect copies of websites and by convincing customers that they are actually ordering from the seller’s official website. In the unlikely event that ‘La Compagnie du Chocolat’ should become victim to such fraud; they can in no way be held responsible, being themselves the victim. This contract is subject to French law. This contract is based on a French original. Only French courts have authority in cases of litigation. Please be aware that when visiting our website, cookies are automatically installed on your browser (a cookie is a small piece of data which does not allow for identification but rather saves the browsing history of our website users). In general, cookies have an ID number or code allowing us to identify returning customers to our website. The use of these systems enables us to recover statistical data to improve our website and better meet your needs. This data will never be passed on to a third party. Please be aware that your browser has features allowing you to block these cookies from being saved, to receive alerts before accepting these cookies, and to delete them. For more information on cookies and the handling of personal information, please visit the CNIL website: www.cnil.fr (equivalent of the Information Commissioner’s Office).